Not all thermometers are accurate! Find out which ones are. Most children will get sick sometime during their first year, and the sad thing is that they have no way of telling us they don’t feel well. Imagine having the flu and being totally unable to do anything about it except cry. It’s heartbreaking, and it can actually be pretty dangerous. One of the best (and really, the only reliable ways) to tell if your baby is sick is by using a good, accurate thermometer. A thermometer should be in any parent’s arsenal, and if you don’t have one yet, well, you should get one. But wait, mommy! You can’t just run out and by any old thermometer! Infants especially need a thermometer that is specifically made for them, and some types of thermometers are way more accurate than others. Our guide will show you what to look for when shopping, and tell you everything you need to know to make a smart purchase. Temporal artery (forehead) thermometers are the newest on the block. They’re also the most expensive, but for good reason. They use infrared technology to scan and measure the temperature of the temporal artery on the forehead. Since you don’t need to actually touch your baby, they’re not only the safest and most convenient, but they’re very accurate, and they’re even used in hospitals. It used to be that these thermometers were only used on children 3 months and older, but research showed that they were accurate for any age. However, for children under 3 months, it’s advised to double-check with a rectal thermometer. Axillary (armpit) thermometers are the least accurate, but are also the least-invasive. These are generally the last resort if you’re unable to use a different type of thermometer, and not really recommended. If you want to go with something cheap and non-invasive, an under-the-tongue digital thermometer is a better choice. Ear canal thermometers are a common option as they are minimally-invasive and easy to use. They are simply placed in the ear and give a reasonably-accurate temperature reading for children over 12 months old. However, they are deceptively difficult to use, as you have to place them in the ear at exactly the right position to get an accurate reading. They are not optimal for children younger than 12 months, as their ear canals may be too narrow to get a proper reading. Oral thermometers are safe and easy to use, and give generally accurate readings. They simply are placed under the tongue for a few moments. These are a good choice for children over 4 years old. Pacifier thermometers are thermometers built into a pacifier, meant for young babies. While this might seem like an ideal option, they aren’t recommended by doctors as they don’t give very accurate readings. These should be avoided. Not all thermometers are suitable for all ages; here is a general guideline to follow when selecting a thermometer for your baby. Your pediatrician will likely recommend using a rectal thermometer for the first 3 months of their life; they’re by far the most accurate, especially for infants. It’s crucial that you can get an accurate temperature reading to make sure your baby is doing well, and the other thermometers just won’t cut it. While forehead thermometers are mostly pretty accurate and could be used, if you’re at all concerned that they might have a fever, double-checking with a rectal thermometer is ideal. You should check with your pediatrician before you use one of these for the first time, just to make sure you’re doing it correctly. We would recommend the Safety 1st Gentle Read Rectal Thermometer (click here to check price on Amazon): it’s very inexpensive, gives a fast reading (5-6 seconds) and is easy to wash and clean compared to other rectal thermometers. It meets all of our safety recommendations: it has a flexible tip and a guard to prevent dangerous insertion. Many people prefer this over other multi-purpose thermometers for one reason: this one is very simple to use and has no settings to mess around with. It just turns off and on and gives an accurate reading. Plus, why would you want a thermometer that can be used both rectally and in the mouth? It’s just gross. This thermometer is highly recommended for all parents of infants. You can upgrade to a non-rectal thermometer when they’re older! For ages 3 months and over, using a forehead (temporal artery) thermometer is a great idea. My favorite forehead thermometer is the Exergen Temporal Artery Thermometer (click here to check price on Amazon). Temporal artery thermometers aren’t the easiest to use, but with a little practice, you’ll get the hang of it. You just swipe the end of the thermometer gently across your child’s forehead, and it reads the temperature with accuracy. These thermometers are often used in hospitals, which should tell you something! Just make sure to read the instructions thoroughly and remove the protective end cap before you use it! You might laugh, but this is a common mistake parents make when first using this. To use it, all you do is put it in the center of your child’s forehead, press the button, and swipe it gently across to the temple. You’ll hear a beep to let you know that it’s working correctly, and if it is, you should have a very accurate reading of your child’s temperature! It’s simple to use with a little practice. It takes a 9-volt battery, which is easily replaced, but it should last a long time before you have to do that. The only real downside to it is that extreme temperature variations in the room will throw the reading off, so if you bring it from a cold room to a hot room, let it sit for a few minutes before you use it. All in all, this is a great forehead thermometer, and highly recommended. 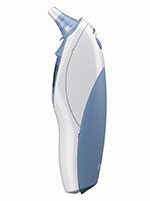 Our choice for the best ear baby thermometer is the Braun Thermoscan Ear Thermometer (click here to check price on Amazon) – it’s a great product that can actually be used as an ear thermometer as well as orally, rectally, or underarm so it has many functions other than just using it as an ear thermometer. It has great ratings from parents who use the thermometer and is decently-priced for a digital ear thermometer. This thermometer is actually used in some hospitals, which tells you a lot. It’s very reliable and accurate, and a lot of pediatricians recommend it, too. If you read about this thermometer online, you hear all about doctors and hospitals using it! It works pretty quickly and should give a result in about 2 seconds. It requires 2 AA batteries which are included, but I’d recommend getting some rechargeable batteries. All in all, this is a really great little unit and I think you’ll love it. There’s a reason why it’s used by doctors. 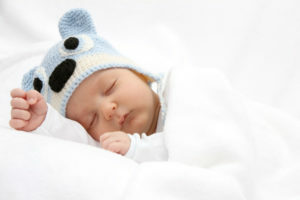 Which Baby Thermometer is Best For For My Child? This is just a guideline of when the different types of thermometers are suitable. There are some aspects of the various thermometers that might make them unsuitable for certain children. Here are some things to think about. Rectal thermometers are the most accurate. If suitable, you should try to use either of these methods, especially for younger children. When a baby is an infant, having a temperature reading that’s even a few degrees off might make the difference of needing a trip to the hospital or not. Oral thermometers are also accurate. 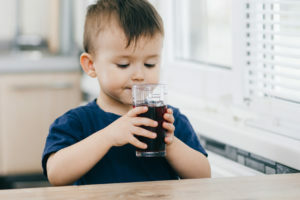 However, using an oral thermometer and getting an accurate reading means that it has to be in your child’s mouth—without moving—for several minutes. This generally makes them only suitable for older children. Temporal artery thermometers are excellent and very accurate. They are overall the best thermometer for most children, and you can most likely use them even on your infant, but a rectal thermometer is the most trustworthy. If your baby has diarrhea or any other sickness that might make it too uncomfortable to use a rectal thermometer, go with an axillary (armpit) thermometer. 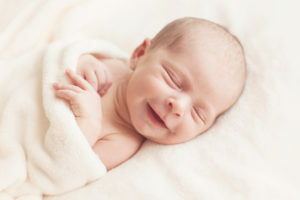 Of course, using an armpit thermometer is only possible if your baby will stay still for the few minutes needed to take an accurate temperature reading. It should be noted that axillary thermometers are the least accurate, so they should be only used on older children. Ear thermometers are very popular and easy to use. However, they are not always the most accurate and shouldn’t be used on children under three months of age due to their smaller ear canals. Things like earwax can also lead to an inaccurate reading. Ear canal thermometers are a good option for older babies and children. They are minimally-invasive and are acceptably accurate, but only for children that are about six months of age and older. A good ear thermometer should be accurate enough for older children and can replace the use of rectal thermometers. While mercury thermometers used to be very common, experts now say that you should avoid using them because they are potentially dangerous. If the thermometer breaks, it can cause the mercury inside can vaporize, which leads to toxic fumes. Experts have recommended avoiding mercury thermometers for many years now, so you probably won’t even find one in stores, but if you happen to have an old one, you should dispose of it and get a new, safe digital version. Didn’t Find a Thermometer You Liked? If you didn’t like our thermometer choices, feel free to click here to see the best-selling thermometers. You’ll probably find one you like! Thank You! Information was very helpful.